Sweet succulent plums are part of the stone fruit family. There are more than 100 varieties cultivated in the U.S. and they all fall into two main categories: Japanese or European. 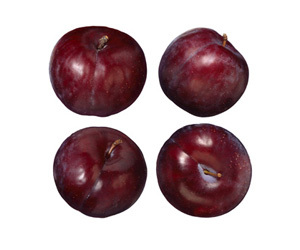 Select plums that are plump with a sweet aroma and free of bruises and shriveled spots. Skins should have full color (red plums should look mainly red and purple plums mainly purple). A dull white film or “bloom” on the skins is natural and indicates freshness. If fruit is to be used immediately, select plums that yield to gentle pressure and are slightly soft. Avoid any that feel very soft. If ripening fruit at home, select plums that are firm, but not hard. Ripen firm plums in a loosely closed paper (not plastic) bag at room temperature for 1 to 2 days. Check often for ripeness as plums are fairly perishable and ripen quickly. Plums are ripe when they yield to gentle pressure. Use ripe plums immediately or refrigerate for up to 3 days. Do not refrigerate unripe plums as this inhibits the ripening process and causes the fruit to become dry, mealy and flavorless. Plums are usually used with their skins intact. Wash the fruit before cutting. Remove the pits from freestone plums before slicing. Cut in half around the seam to the pit. Twist the halves in opposite directions to separate them. Pull out the pit. Clingstone plums cannot be pitted. To slice or quarter, make cuts with a paring knife toward the center and then around the pit, lifting out each slice. Taste plums before cooking. Tart varieties may require a bit more sugar than a recipe specifies. Balance the flavor of sweeter varieties with a drizzle of lemon juice. Avoid overcooking plums as the flesh breaks down into a purée. Toss sliced plums into your favorite fruit or green salad. Top pancakes and waffles with sliced plums, toasted PLANTER Pecan Pieces and maple-flavored syrup. Add sliced plums to a cheese tray with KRAFT Sharp Cheddar Cheese and ATHENOS Blue Cheese. Serve with assorted crackers for an easy appetizer. Top shortcakes with sliced plums instead of strawberries. Bake into juicy pies, tarts, cobblers or crisps. Poach plum halves in spiced white wine or fruit juice and serve alone or over ice cream or pound cake. Cinnamon, nutmeg, cloves, lemon, orange, poultry and pork pair well with plums.